Located at the tip of the Ise Fjord in Eastern Denmark, Rørvig is barely one hour by car from Copenhagen, but it’s a world away. It’s a quiet fishing village exposed to the North to the winds from the Kattegat, so it’s no surprise that it’s one of the birthplaces of our sport. It’s been the host of many Kona regattas over the years, but this year’s edition in August was very special because it was the inaugural Kona Danish Championships! Allan Koch tells us about the event, the vibe of the place and his personal history with the sport we all love! People my age sailing together with their kids! How fun! Story: Allan Koch | Photos: Brian Engblad (@ilostawavein79). 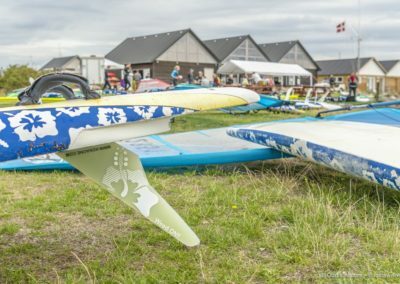 We had 38 boards on the start line this year in Rørvig for the Kona Danish Championships! I think I can safely say that the Rørvig regatta is the one that everyone is looking forward to attending every year. The race committee is absolutely professional, the venue is beautiful, the wind is great, and the competition is always fair. Oh, and the food is amazing too: from breakfast to lunch and the infamous party dinner, our drinking songs resonate long into the night! 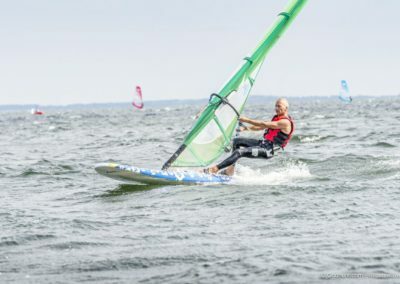 Back in the late seventies, when windsurfing first took a hold in Denmark, Tim Aagesen was the guy to beat – and he still is today! He dominated the proceedings this year, but the battle was intense behind him. After eight hard-fought races, Magnus Lindstedt (SWE) edged out Rasmus Riis (DEN) for second place, and Brian Guhle (DEN) completed the Danish podium. I finished the event with two really good races to end in 9th place overall, just one position ahead of my good friend Jesper Schmidt! When the Kona first came out, Tim was quick to recognize its qualities. He was looking for a class where everyone again could have fun windsurfing together, party and have a great time – where the social part was just as important as the sailing, and where you could compete fairly without having to spend all your money on a ton of gear: the newest fins, the latest carbon booms, a full quiver of sails, etc. Tim didn’t have to work too hard to convince many of us that this was the class for us. Jesper and I joined the Kona family way back in 2009, and we’ve participated in almost every regatta in the region since then! Many of our first races were in Sweden, but after the Kona Worlds in Nivå in 2011 (guess who won? 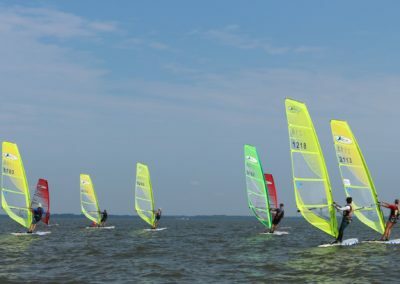 ), we started to organize more local events, and today Denmark has one of the most active windsurfing scenes for the Kona class. Our Swedish friends come to our events, we go to theirs, and our bond gets stronger all the time! I’ve been windsurfing for a long time! I started windsurfing in 1979 on the original windsurfer (we called it Ten Cate in Europe) and Mistral. I moved to Canada (Winnipeg, Manitoba) in 1980 and became a certified instructor. Back then, I spent all my weekends in the summertime teaching others and racing my heart out. I was the first person in Winnipeg to take out the daggerboard and carry it over the shoulder on the downwinds. Some of you might remember what that was like! I went back to Denmark in 1982 and brought back four Mistral Competition Lights with me to Canada to kickstart the class there. 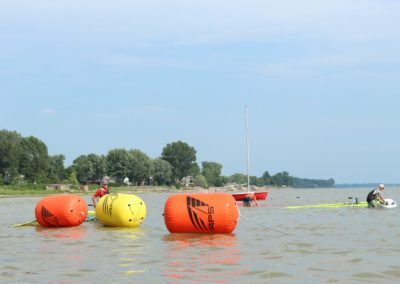 The following year, I moved to Connecticut and was a regular at District 7 and District 8 regattas, but I returned to Canada for the 1983 Worlds in Kingston. What an event that was! They had 500 boards lined up on the beach for us – wow! 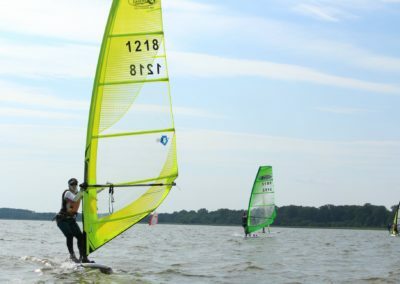 I stopped windsurfing in 1985 after a shoulder injury, not windsurfing again until 2008, when I dusted off my old Mistral and participated in my local club’s regatta. In 2009, I borrowed a Kona One from Tim to take part in the Swedish Championships, and I was totally sold on the concept and the great community – people my age sailing together with their kids! How fun! Thanks to Kona, I feel that I haven’t missed a beat. It’s been ten years since my return to the sport, and I’ll be in Clearwater (Florida, USA) in October for my 10th Kona Worlds in a row! I can’t wait to meet new people and invite all of my new American and Canadian friends to join us in Europe next year for what will be my 11th Kona Worlds. I’m not stopping anytime soon! 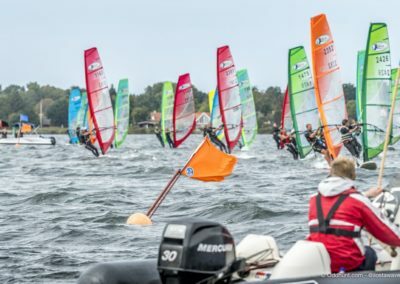 Here are the results from the 2018 Danish Championships, and a full photo gallery on Brian’s blog.